Boots Pharmacies had their knuckles rapped recently for listing medical conditions in their in-store, point-of-sale (POS) advertising of homeopathic products by the medicines regulator, the Medicines and Healthcare products Regulatory Agency (MHRA). The products — made for Boots by A Nelson & Co Ltd — are not licensed with therapeutic indications, ie they are not allowed to say what medical conditions the manufacturers think they can be used to treat. This isn't because — as many homeopathists would have us believe — there is some big conspiracy against homeopathy, but because, for the homeopathic products registered with the MHRA, not one jot of scientific evidence of their efficacy is required as part of that registration. Advertising the products with therapeutic indications would therefore be misleading. This advertising, found in many Boots stores, took the form of a booklet of next to a rack of homeopathic products. The booklet listed indications, symptoms and corresponding homeopathic products. Boots have now agreed to remove all such advertising from their stores. 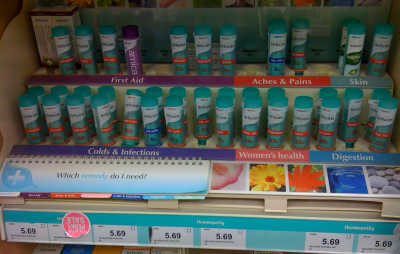 But Boots aren't the only shops that sell homeopathic products and many others have similar POS advertising that lists medical conditions for those products: we've seen it in branches of high street 'health' food shops, particularly for Nelsons own-branded products. We are sure that Boots will take their responsibilities seriously and remove all such advertising. But what if you find a store that hasn't? What do you do if you find a health food shop with a similar booklet? You could politely ask to speak to the manager or the Superintendent Pharmacist and make them aware of the MHRA's decision against Boots and ask them if they will review their advertising. But if you're not confident about doing that, we have produced an information sheet that you can download and print out (in black and white or colour) to help you. 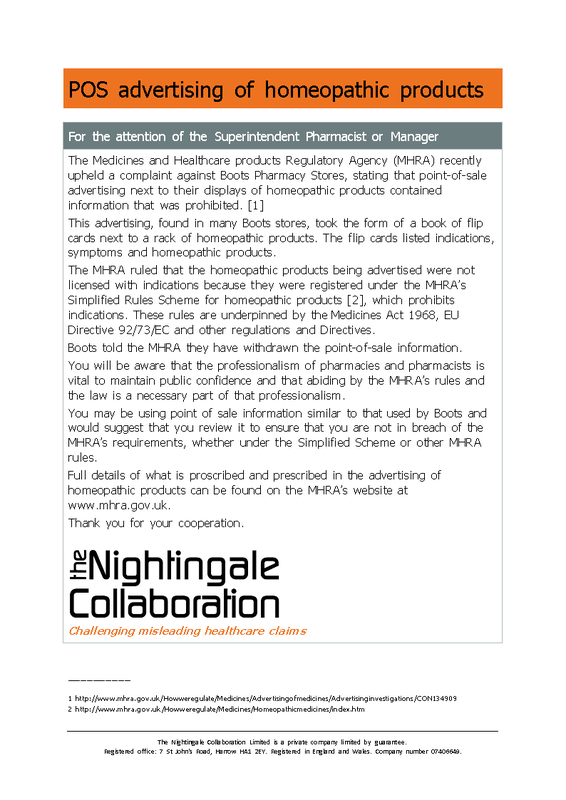 We've made the sheet informative and non-confrontational: it simply gives details of the MHRA's decision and asks that the shop reviews its in-store advertising to make sure it complies with the MHRA requirements. If you are successful in persuading a shop to remove these unlicensed indications, please let us know; if you find that the advertising hasn't been removed, please also let us know.